Susan B. Komen For The Cure’s decision to pull funding from Planned Parenthood, and its reaction to the backlash that followed, were a public relations disaster and a classic example of what not to do. On Tuesday, January 31, Susan G. Komen For The Cure announced that it would not renew its grants to Planned Parenthood for breast cancer exams, claiming that it doesn’t permit funding to organizations under investigation by Congress. This is equal to more than half a million dollars for low-income women who otherwise would have no options for breast cancer screening and other services. This announcement was not made publicly, but instead communicated to Komen’s 100-plus U.S. affiliates. Quietly. A done deal. Not up for discussion. Cecile Richards, president of the Planned Parenthood Federation of America, got the news by phone in December, and was unsuccessful in setting up a meeting to clarify the issue with the Komen board. Critics pointed out that the Planned Parenthood was the only organization affected by the new rule, and that the real reason was that Karen Handel, the new senior vice-president for public policy, is a self-described evangelical Christian who has stated that “I do not support the mission of Planned Parenthood.” It’s hard not to see women’s health getting politicized. And at this point you might be saying: What? Did they think people wouldn’t find out about this? Does the board of Komen not know about social media? Did they learn nothing from SOPA? What happened next was that social media exploded. On Twitter, on Facebook, in online petitions and letters and blogs and message boards. Public figures like Sen. Barbara Boxer (D-Calif.) and Rep. Jackie Speier (D-Calif.) withdrew their support for Komen. 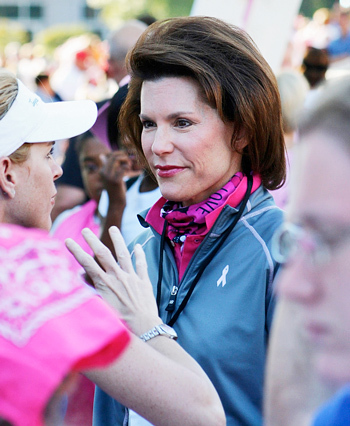 Three top officials at Komen resigned their positions. Individual Komen affiliates said they would not abide by the new rule. 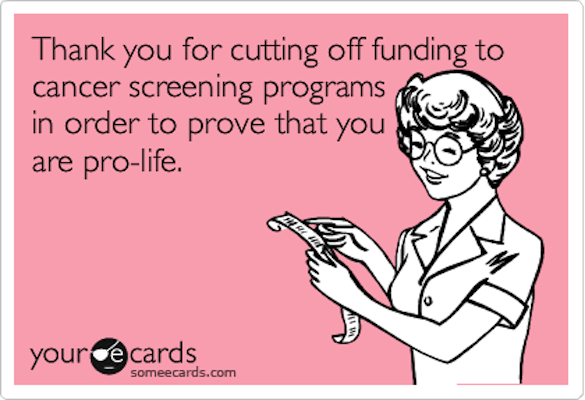 And 26 U.S. senators signed a letter asking Komen to reconsider its position on Planned Parenthood. The “right” people?” Hey, dig yourself a little deeper! 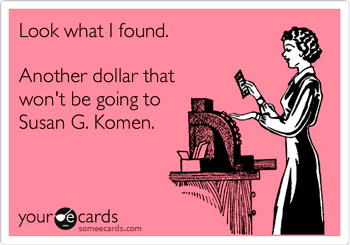 Finally, on Friday, Komen did the obvious and reversed their decision. Brinker apologized in a statement and said that the new rule would only apply to investigations that were “criminal and conclusive in nature.” They didn’t promise to renew the grants, only to ensure that Planned Parenthood is eligible for them in the future. They said “sorry,” but it was a not-pology. It’s incredible that the folks who run Komen were so clueless about the effect their actions would have on a brand that’s been built over three decades. They completely ignored both the mainstream press coverage, as well as social media outcry; they chose not to communicate with their supporters, either through Facebook or Twitter, and made transparently disingenuous statements to the press, in light of information coming from former Komen employees and documentation. Will the Komen brand ever recover? Unfortunately for them, they were already getting some negative publicity for their tendency to sue anyone using the phrase “For The Cure” and the color pink for other charities. While they certainly have the right to protect their intellectual property, Komen comes off as a big bully when they start sending cease-and-desist letters to tiny charities run by individuals. They are going to have to work long and hard to win back the masses of people who now view them as an organization driven more by politics and the personal beliefs of its executives than its concern for women’s health, in whatever form that may take. One wonders if Handel or Brinker will have to step down to effect the change. Or perhaps they’ll decide that they want to hitch their wagon to a particular ideology, and stop pretending that they aren’t pushing an agenda. The good news out of this debacle is that Planned Parenthood has raised an enormous amount of money–nearly a million dollars, donated directly to them. You can, too, if you’re so inclined. And while you’re at it, write a letter to Nancy Brinker to let her know what you think. Perhaps someone can explain that “very, very favorable” does not mean what she thinks it means. Laurel Sutton is a partner and cofounder at Catchword, a full-service naming firm.